White teeth have always been thought the hallmark of vigor and good health: the Egyptians, the Greek and the Romans come up with the first toothpowders, from a flower, resin, and abrasive substances base. Recipes multiply thereafter. Most are homemade remedies mixed with burnt bread, coal or ground-down bricks. We have to wait until the end of the nineteenth-century to get a real and proper revolution: in 1893, when doctor Washington Sheffield makes the first paste in a squeezable tube (up until then you could only buy toothpaste or toothpowder in glass jars). A few years later Colgate starts large-scale selling, taking charge of the global market. Toothpaste in a tube arrives in Italy with American soldiers, immediately entering the post-war lifestyle: the economic boom drives several pharmacies to whip up new recipes that enhance people’s smiles. 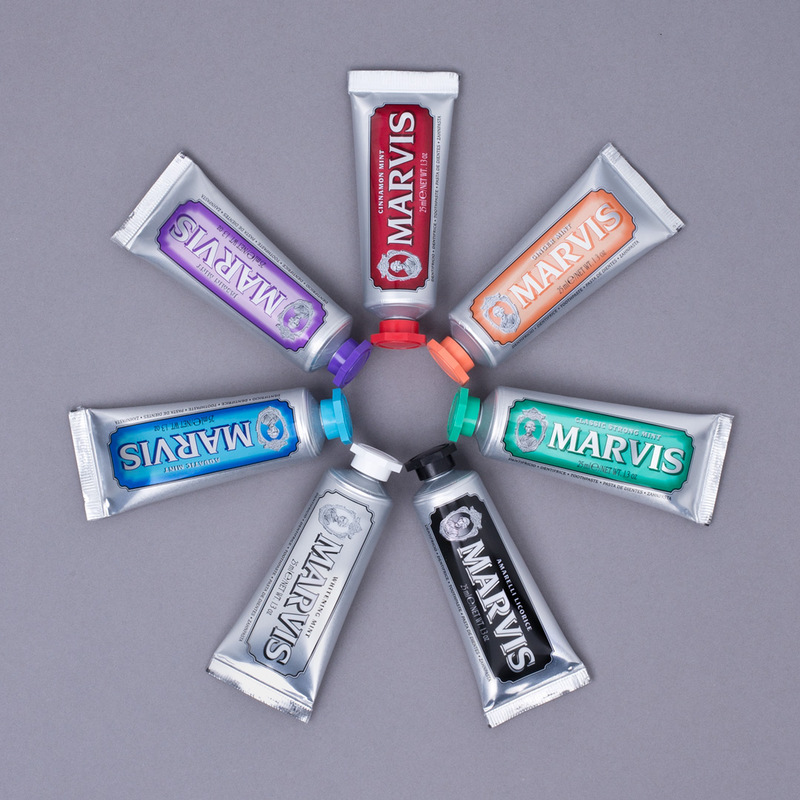 The Marvis formula arrives in the 50s, among various others: a toothpaste in an elegant, metallic tube. The Florentine company Ludovico Martelli, est. 1908 as a distributor of eau de cologne and producer of beauty creams, takes ownership over in the 90s, adding to a new mint-flavored aesthetic to smiles. Today the company is in its fourth generation, and continues in its traditional production, combining dentifrice paste in seven different and brightly colored flavors. A contemporary rainbow that, starting from Italy, has spread across the world to become an icon of style in oral care.